I came across two very different outlets of modern British beer in the West Country at the weekend. One was a highly-evolved descendant of that old, artisanal, hand-prepared chestnut: the gastropub. The other was a very on-trend, hipster-magnetic craft beer and pizza joint that still had a unique character all of its own. Both places are owned by Bath Ales, which owns a handful of pubs in the Southwest, mostly around Bath and Bristol. Graze Bar, Brewery and Chophouse is, as you might guess from the name, more than just a gastropub. It is the third Graze that Bath Ales has opened, following more traditional-looking outlets in Bristol and Cirencester. The Bath incarnation is part of the newly built foodie-centric Vaults development around Bath Spa train station. Graze is actually on a level with the station’s platforms, but is accessed by stairs or lift from below. Graze is very large, about on a par with Bristol’s Zero Degrees, and the similarities do not end there. Unlike any of Bath Ales’ other pubs, the Graze in Bath has a microbrewery plant in the midst of it. It didn’t seem to be active at the time of my visit. Aesthetically, however, Graze couldn’t be more different to Zero Degrees. Instead of dazzling chrome, Graze is all about pine, Bath stone, copper, brass and soft leather. The whole place is like a purpose-built pub-showhome, and is quite beautiful. I would suggest checking out that link above to see for yourself. I couldn’t capture it easily on a smartphone camera. Basically, Graze is a long rectangle shape with glass walls on its longest sides and balconies outside them. One side overlooks the city, the other provides a view of the picturesque countryside beside the train station. A shiny island bar lounges in the middle, and everyone looks pretty pleased to be there. The food is geared towards fancy cuts of beef, pretty little starters and vibrant seafood. The beer has a upmarket mainstream selection, alongside ales and cider from the parent brewery. I had the market special fish of the day, which was a beautiful smoked haddock kedgeree (£13). I had this with a pint of the Special Pale Ale (Bath SPA – geddit? ), and may have found my beer and food match of the year so far. SPA is brewed with lager malt, making for an extremely clean and lively beer with a simple and gorgeous peachy, grapefruit character. The fish melted in the bubbles of the SPA, the smoke was enhanced, then sweetened. 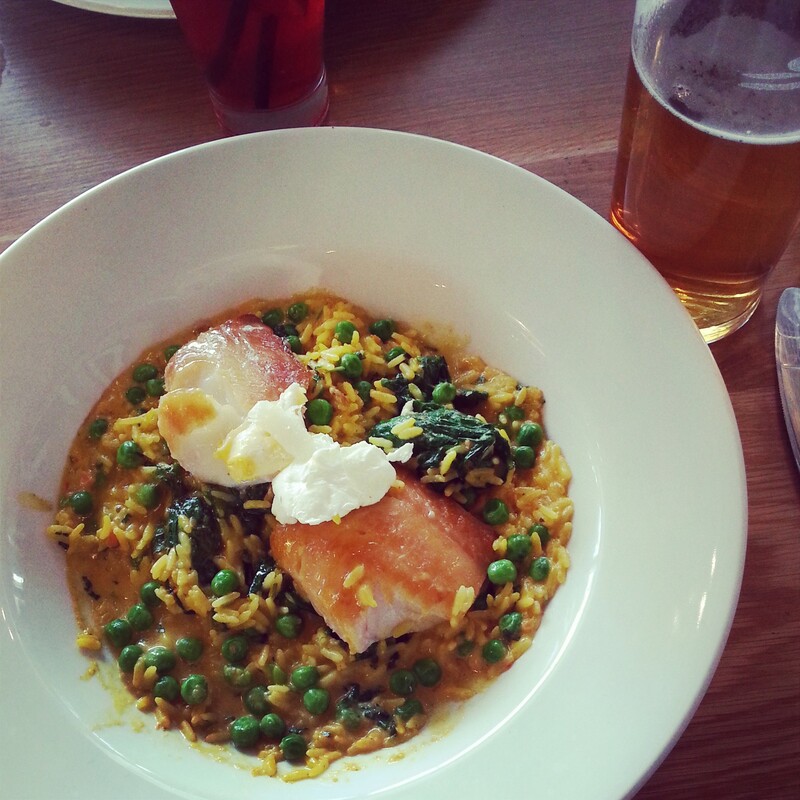 The spices in the kedgeree were lifted and boosted by the lightness of the beer and its carbonation. The hops didn’t clash with the heat but became a part of it somehow. It was one of those meals that makes you think: I MUST know how to make this at home. I’ll let you know how I get on. 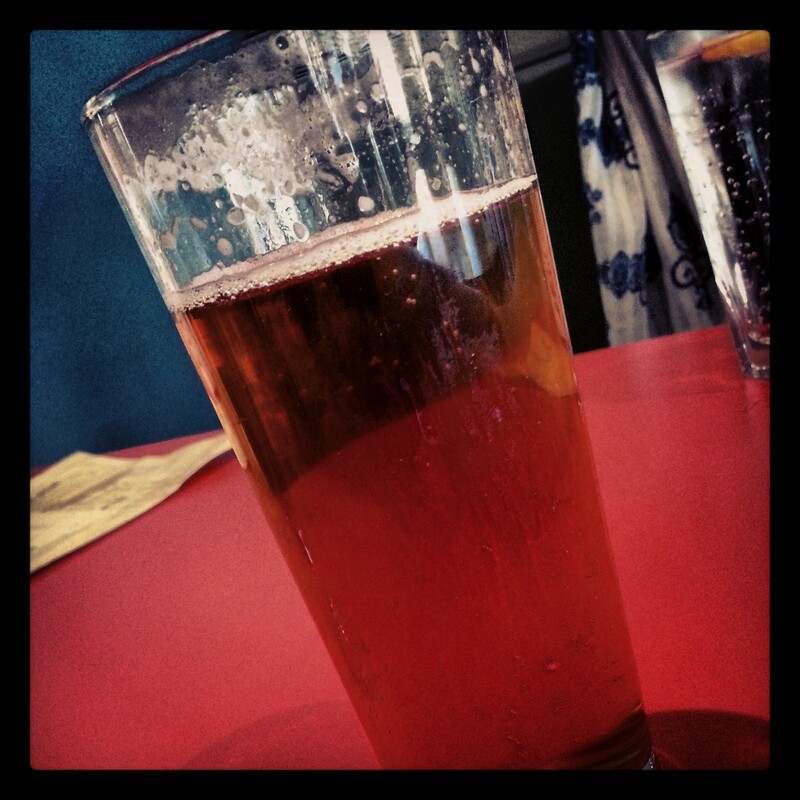 Graze is a really special place, and an absolute must-visit for beer and food lovers in that part of the West. So what of the other side of the Bath Ales estate? Well this is a story in two parts. First, the bar itself. 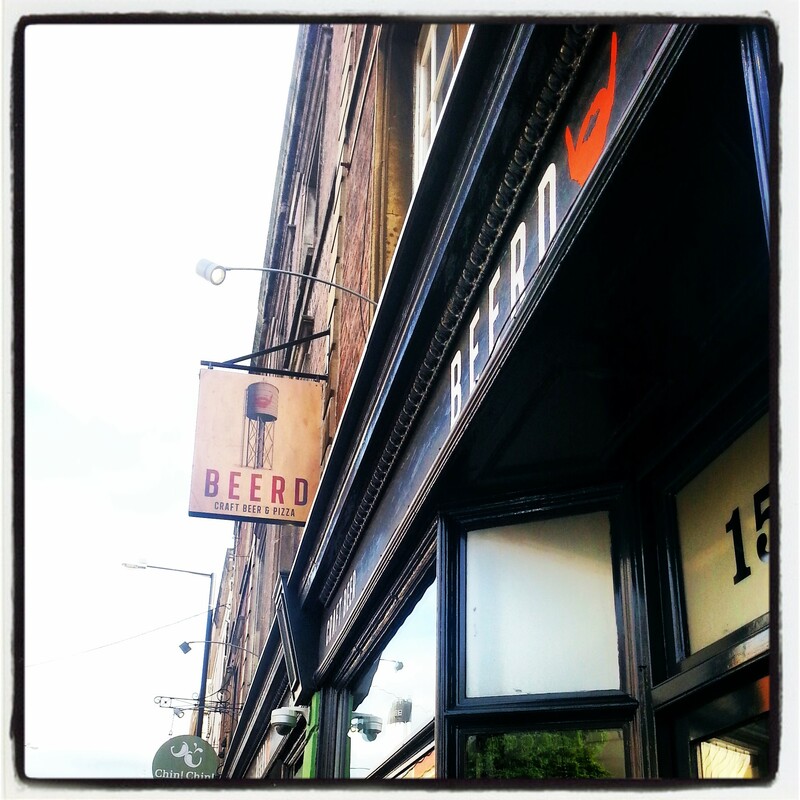 Beerd is a ‘craft beer and pizza’ joint in the studenty, trendy Cotham area of Bristol. Its name, with a very Bristolian sense of humour, may poke fun at the both real ale and craft beer hipsters (the free WiFi password is ‘beardyweirdy’) but that is where the jokes end. This is a cutting edge craft beer bar that provides a cool, credible location to choose between quality cask and keg beer. 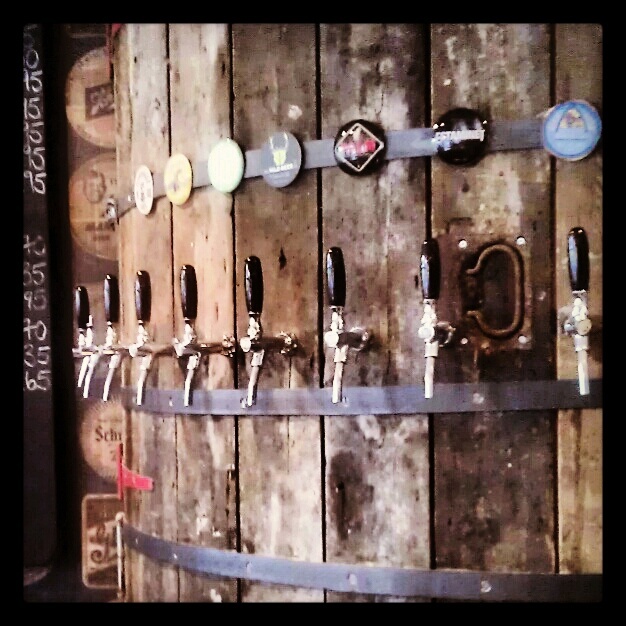 The stainless steel handpulls (featuring Bath, Black Rock, Penryn among others) are topped with mismatching BMX handlebar grips, whilst the keg beer taps (including Anchor, Wild Beer Co, Palm, Moor) stick out of a giant wooden cask. All right, maybe that’s another joke too. There’s also a solid and ever-changing selection of bottles to rival a BrewDog bar. The rest of the décor is more mismatched craft beer chic: kitsch plastic chairs alongside metal stools, and formica tables next to old driftwood topped tables. The wallpaper is a very cool pastiche of beer brands, and the whole place has a trendy student vibe that still feels welcoming to all ages. It’s a very Bristol kind of place, friendly and alternative. You can imagine something like it existing there whether there was a beer renaissance going on or not. The food range is slightly more than just pizzas (one nice idea is that you can have any pizza’s toppings as a salad instead), but not a lot more. There’s lots of responsibly sourced vegetables and deli-quality Italian meats. I went for an Artichoke, Roasted Pepper and Rocket pizza (about £9), and added some Prosciuttio and Salami because I’m worth it (an extra £2). I ate the first half with Wild Beer Co’s Spellbound, a Brettanomyces yeast golden ale, which wasn’t entirely intentional but it worked better than you’d think. The spicier esters from the lively yeast played along well with peppery rocket and the crispy base. 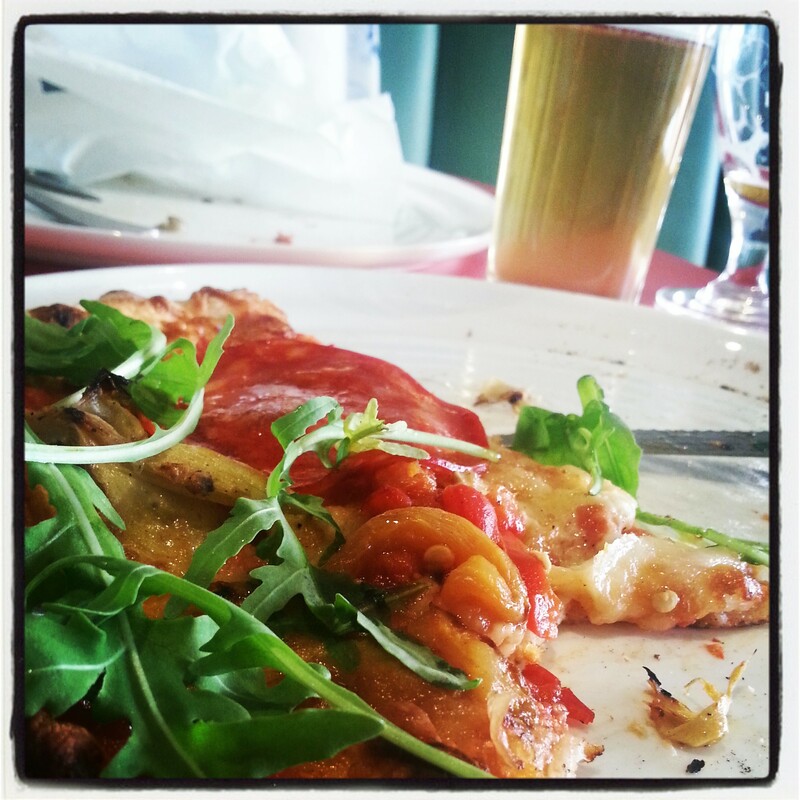 The rest of the pizza was finished with Moor’s Nor’Hop, which was simply sensational. The hops danced with peppers and the rocket, the carbonation melted the crispy base in my mouth, and the sharpness cut the oily, salty meat and cheese to bits. An amazing combination, so delicious that I forgot to take a picture of it until I’d almost finished it. It gets even better. Beerd is no longer just the name of the bar, it’s also now the name of Bath Ales’ new microbrewery operation. Two of Beerd’s new beers were available on the bar: Big Small Beer and Dark Hearths. Big Small Beer is a low ABV (2.8%) pale ale with a ferocious hop bill, balancing a light body with thick portions of soft fruit and sharp tropical juice. Dark Hearths is a ‘peated porter’ with an oily body and Schlenkerla-like stickyness to its smoke character. Both were really, really good. More beers are on the way, and those two alone mark Beerd out as a brewery to watch. As far as I can tell, Beerd is brewing in a separate part of Bath Ales’ main brewery. That little microbrewery plant in Graze seems to be a separate project. The idea of a ‘perfect pub’ is not a new idea, but exciting beer destinations – those sorts of places that we will happily take awkward, multiple-connection-strewn journeys to find – are certainly a big part of the current beer renaissance. Bath Ales’ approach is exciting. By creating different beer destinations that different people will enjoy, they are embracing the diversity that good beer encourages. A fantastic review. Can’t wait to get to The West Country to try these out! Thank you, Richard. I highly recommend them both! It’s interesting that Bath Ales now have a microbrewery/pilot plant. I see Bath taps around, their bottles are in supermarkets, but I can never seem to convince myself they’re a large brewery. I’m not a big fan of their beers, in truth, but that peated porter is one I’m going to have to try. I think that as a brewery they’ve suffered from not getting their best beers beyond local distribution. If all you ever see of them is core beers like Gem and Dark Side then that’s all you think they’re capable of. If the Beerd stuff gets bottled and the casks make it out of the local area, I think it’ll sell well.